Punjab is in an uncomfortable political position with Capt Amarinder Singh and Mr Parkash Singh Badal showing few signs of reducing mutual tensions. They are heading for a major conflict. The latest is the “murder plot’’ charge by former Chief Minister Parkash Singh Badal against present Chief Minister Amarinder Singh. Senior leader of the Panthic Morcha, Ravi Inder Singh has described Mr Parkash Singh Badal as a compulsive liar, who had looted the state and emptied its coffers during his regime. Talking to newsmen, Mr Ravi Inder said today that Mr Badal was responsible for the total decay of the Akali party and the SGPC. “The increasing incidence of young married girls being deserted by their NRI grooms is a serious matter and urgent action needs to be taken,” reads the letter Congress President, Sonia Gandhi wrote to Punjab Chief Minister Amarinder Singh on October 4. Even as about 400 selected candidates for the post of primary teacher in the state had failed to join duty over the about nine months, the Education Department has adopted an indifferent approach by not filling the vacant posts from the waiting lists of deserving candidates prepared by the various district departmental selection committees. The Vice-Chairman of the National Commission for Minorities, Mr Tarlochan Singh, today expressed dismay over the failure of various Sikh organisations, including the SGPC and the Chief Khalsa Dewan for failure to end illiteracy in the state. Working in Punjabi may be top on the Punjab Government’s agenda, but the state Language Department is not on its priority. Power to the department headquarters here has been disconnected due to non-payment of electricity dues even as the Plan budget for the current financial year has not been released to it. Mr Jagjit Singh Joga, district secretary of the Communist Party of India, in a press note here today said that the Congress had engineered defections and the two CPI MLAs who joined the Congress recently should seek re-election on Congress ticket to prove their popularity. Amidst confusion and pandemonium, Congress-supported members took over the management of the ancient Durgiana Temple here today. Congress activists and members stormed the office of the Durgiana Committee and forced the BJP-backed members to give up the control over the temple and hand over the entire record, cash offerings and other items to them. The row between followers of the Divya Jyoti Jagriti Sansthan of Ashutosh Maharaj and certain Sikh organisations over the holding of a function by the former here on Sunday was resolved with the intervention of Deputy Commissioner K. Siva Prasad here. More than 10,000 families residing within 1,000 yards of 2, Ammunition Sub-depot ( 2A S D) Mamoon, cantonment, 18 Field Ammunition Depot and Air Force station here are worried over the government proposal to notify the area for the purpose of acquisition. Residents of Phillaur have been provided better medical facilities with the shifting of the local Government Civil Hospital to a new and upgraded 50-bedded hospital constructed with a cost of Rs 141.24 lakh. About 1.6 lakh persons fall victim to colon cancer in the USA every year, mainly due to the excessive intake of meat-based products and the use of alcohol and tobacco, while the incidence of the disease is much less in India, where people generally have vegetarian food. Traditionally known for its thickest green cover, this city of saints has got another green belt, thanks to the efforts made by the Department of Forests, which has beautified the Dhussi bundh along the Bhangi choe by planting nearly 12,000 saplings of different species of trees. The noted US-based knee replacement specialist, Dr Kant Samuelson, performed knee replacement surgeries at Amandeep Hospital here today. Earlier addressing a largely attended international conference on knee replacement, Dr Samuelson, who has designed the latest total knee implant, said the new medical technology in the field of orthopaedics had revolutionised the cure of joint problems. As many as 25,000 Afghan Sikhs and Hindus who had taken shelter in India during the Taliban region have sought permission from the government of India to return to their homeland. The building of the primary health centre situated in the heart of the city opposite the Gandhi Chowk has been waiting for an organisation or a government department, which could give a facelift to its shabby structure. The former Akali-BJP government had last year decided to hand over the building to the Municipal Council to develop it into a shopping complex but with the fall of the Akali-BJP government the scheme seems to have been shelved. Families of cops heaved a sigh of relief on their safe return from the poll duty in Jammu and Kashmir and performed “aarti” and showered flower petals on them. While the poll staff had returned earlier, the security staff (about 3,000 Punjab police personnel) had to wait to two more days as they were waiting for clearance from Union Home Ministry. The mystery shrouding the disappearance of a village girl has been solved. The girl was allegedly forced to commit suicide as her family members opposed her affair with a village boy whom she wanted to marry. The General Samaj Party said yesterday that caste-based reservation should be abolished and in its place the students from poor families be given help to get education. Mr Rajveer Singh Sidhu, district president of the party, said in a press note here that caste-based reservation had divided the country into different classes which was against the norms of a democratic country. Criticising the Congress government for its failure to seek a review against the high court ruling to reimpose octroi tax in the state during the past five months, the Punjab Pradesh Beopar Mandal has decided to file public interest litigation in the Supreme Court, seeking abolition of octroi tax. The third congregation of the Punjab Khatri Sabha organised here pledged for the removal of social evils while striving to keep pace with advancements and changes taking place across the world. Addressing the gathering, the general secretary of the Punjab unit of the Congress, Mr Surinder Kapur, said: “We should respect our culture instead of aping the west”. Mr Darshan Singh Walia, president, Bir Bhola Truck Union, Bathinda, in a written statement issued here today, alleged that the District Transport Officer, Faridkot, Mr Manmohan Luthra, had been harassing truck operators repeatedly to get illegal gratification from them. The Aasra Welfare Society, an NGO, has observed the first week of this month as the blood donation week with the help of the district health authorities. Mr Ramesh Mehta, district president of the society, in a press note issued here today said in addition to a blood donation camp the society also organised painting competitions, poster making and paper reading contests for school children. As many as three accidents have been reported from various parts of the district during the past 24 hours, but luckily, there was no casualty. 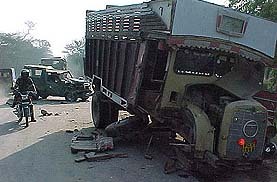 An Army Gypsy collided with a loaded truck on the Bathinda-Barnala road, near the cantonment area, late last night after the truck reportedly developed some mechanical snag. Mr Naresh Chaturvedi, Managing Director of the Food Corporation of India, has directed officials of the agency to procure paddy strictly in accordance with the specifications laid down by the Government of India. Mr Chaturvedi, who visited a number of mandis of Kapurthala, Jalandhar and Hoshiarpur districts along with Mr V.K. Singh, the Senior Regional Manager of the FCI (Punjab region), directed the officials to adhere to norms of procurement in every respect. To give a boost to the economy of Punjab farmers, the state government has drawn up a plan to encourage contract farming of select crops. Speaking at a seminar here today, Mr Rakesh Khurana, Deputy General Manager, Punjab Agro Industries Corporation, said that farmers were being encouraged to grow hybrid sarson (Hyola) and the seed of it were being supplied to them at Rs 500 per acre. Procurement of paddy was in full swing in the district, claimed Mr Anurag Verma, Deputy Commissioner, yesterday. Mr Verma, in a press note said that 1.44 lakh tonnes of paddy had arrived in different mandis in the district so far and out of it 1.08 lakh tonnes had been procured. 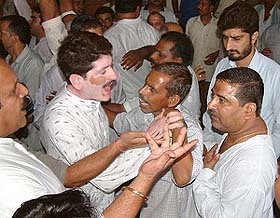 He said that lifting of paddy was also going on. He added that 33,232 tonnes of paddy had been lifted from the mandis. Mr Gora Lal Goyal, president of the Federation of Arhtiyas Association here, has — in a communication addressed to Punjab Chief Minister — said loss worth crores was being caused to the state government by making excessive payments for the labour and carting of paddy by various procurement agencies of the state. The district police yesterday arrested Jaswinder Singh, a resident of Haibatpur, under the Dhilwan the police station in Kapurthala district for his alleged involvement in taking huge sums of money from innocent people on the promise of sending them to Greece and getting them jobs there with fat salaries. The Subhanpur police today arrested nine persons and recovered 120 bags of stolen wheat from their possession near Chowk Bamowal village. They were taking the wheat for sale in the grain market. Mr Sukhdarshan Singh, district president, Berojgar Adhyapak Front, in a press note issued here today said the front had decided to stage a dharna and start relay fast in support of their demands. The Punjab Nav Niyukt Science Mistresses Association today urged the Chief Minister, Capt Amarinder Singh, to stall the implementation of the recommendation of the Lok Pal for cancelling their appointments. In a statement, Ms Anudeep Kaur, association president, said their appointments had been made purely on merit and that no money had changed hands in that process. The pilot project to implement the mid-day meal scheme for children of primary schools will be launched in Rayya block of Amritsar district from tomorrow. Mr K.K. Bhatnagar, Principal Secretary, School Education, Punjab, will launch the scheme. This was informed by Mr S.S. Puri, Deputy Commissioner, at a meeting held here today.